A dead whale that washed up in the Philippines had 40kg (88lbs) of plastic bags inside its stomach, researchers have said. Workers at D'Bone Collector Museum recovered the Cuvier's beaked whale east of Davao City earlier in March. In a Facebook post, the museum said the animal was filled with "the most plastic we have ever seen in a whale". There were 16 rice sacks in its stomach, as well as "multiple shopping bags". The museum will post a full list of the items found in the whale over the next few days. Image Copyright D' Bone Collector Museum Inc. D' Bone Collector Museum Inc.
"I was not prepared for the amount of plastic," the museum's founder and president, Darrell Blatchley, told broadcaster CNN. "It was so big, the plastic was beginning calcification." Five Asian nations - China, Indonesia, the Philippines, Vietnam and Thailand - accounted for up to 60% of the plastic waste that ends up in oceans, according to a 2015 report by environmental campaigner Ocean Conservancy and the McKinsey Center for Business and Environment. In June last year, a pilot whale died in Thailand after swallowing 80 plastic bags. 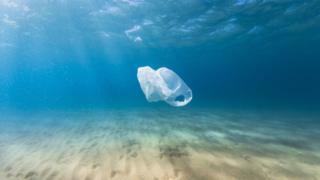 Its death came shortly after a report for the UK government revealed the level of plastic in the ocean could triple in a decade unless steps are taken to curb litter.